Three piyyuṭim forming the Ge'ullah in the morning service of the first two days of Passover, and of Saturday between the first and the last days of this feast ( ). Each of these piyyuṭim begins with the initial phrase of Cant. viii. 14, having regard to the association of the Song of Solomon with the Festival (see Megillot). Poems in this form were written in various epochs by Benjamin ben Samuel of Coutance, France, elenth century; Shabbethai ben Moses of Rome, 1050; Moses ha-Sofer ben Benjamin of Rome, thirteenth century; Menaḥem ben Abraham of Imola, fourteenth century; and Joab ben Nathan ben Daniel of Rome, fourteenth century. The melody to which the verses are recited in some German congregations is that of "'Al ha-Rishonim"; but in the more extended "Polish" use, the melody sung is one of the most effective of all the rhapsodies emanating from the wandering precentors of two centuries past. 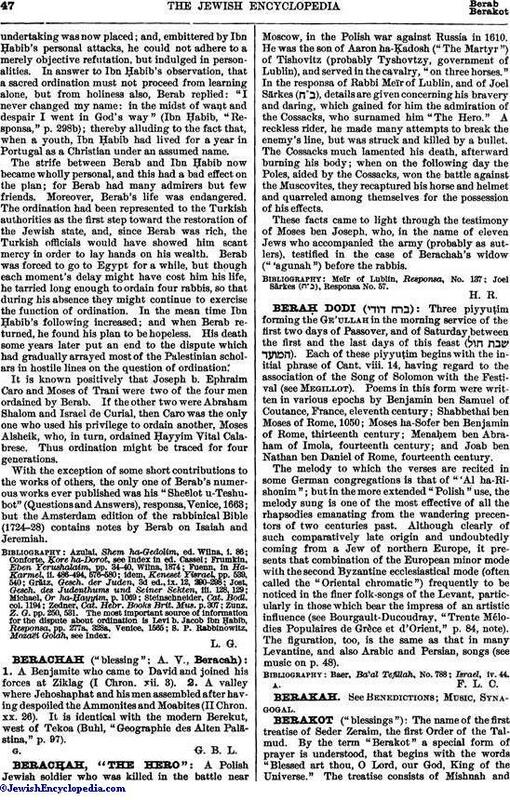 Although clearly of such comparatively late origin and undoubtedly coming from a Jew of northern Europe, it presents that combination of the European minor mode with the second Byzantine ecclesiastical mode (often called the "Oriental chromatic") frequently to be noticed in the finer folk-songs of the Levant, particularly in those which bear the impress of an artistic influence (see Bourgault-Ducoudray, "Trente Mélodies Populaires de Grèce et d'Orient," p. 84, note). The figuration, too, is the same as that in many Levantine, and also Arabic and Persian, songs (see music on p. 48).